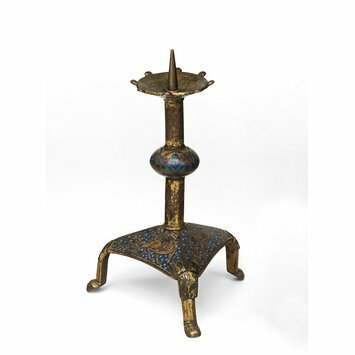 The twelfth century saw the start of the production of enamelled candlesticks at Limoges. This coincided with the increased use of candlesticks on the altar (either singly or, more usually, in pairs) during the Mass, which seems to have been standard practice by the early 1200s. They are illustrated standing on altars on many of the reliquary caskets produced at Limoges (eg V&A, 4041-1856). 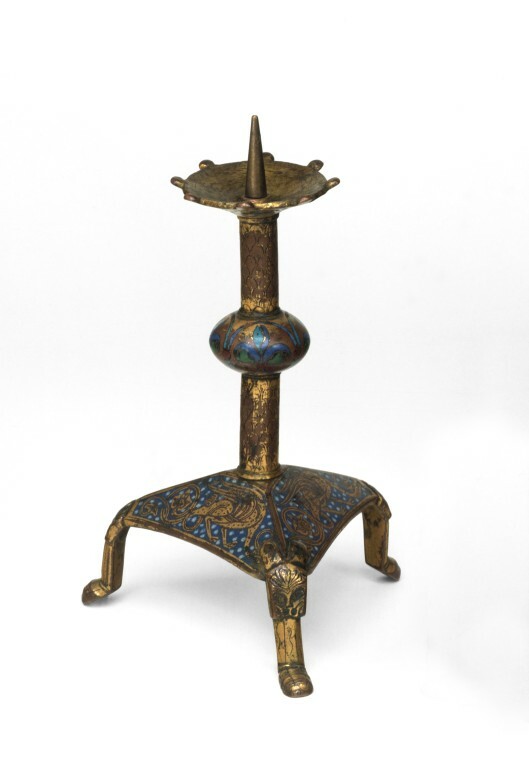 The main decorative features of this V&A candlestick can be found in other surviving examples. Limoges candlesticks were commonly exported. A thirteenth-century inventory of St Paul’s cathedral, London, describes a pair of candlesticks ‘of Limoges workmanship'. Similarly-shaped candlesticks of a larger scale were used in processions, or held by priestly assistants – the central knop on the shaft provided a useful grip. The candlestick has a three-legged triangular base, with three feet, each in the form of an animal's paw issuing from a monsters' head. On each of the three flat sides of the base is an enamel plaque showing a dragon entwined with a long trendilled tail, against a background of blue enamel dotted with white. Two of the dragons are black, and one white. The central stem of the candlestick (which has lost much of its original gilding) is engraved with scales, and has a knop in the centre with enamelled flower decoration. The circular drip-tray/grease-pan has 8 projections with the pricket (possibly a later addition) in its centre - it is decorated with kidney-shaped leaves on a continuous stem in dark blue, green and turquoise, with blue enamel on the underside. 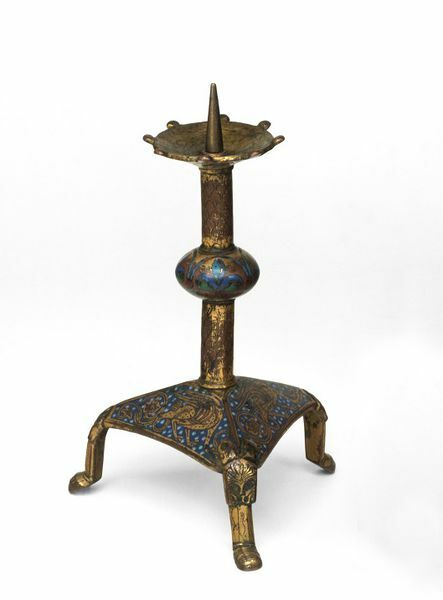 The 12th century saw the start of the production of enamelled candlesticks at Limoges. This coincided with their increased use on the altar, either singly or (more usually) in pairs. In the 9th century, Pope Leo IV had specifically forbidden their use at the Council of Rheims, but Pope Innocent III (pope from 1198 to 1216) referred to paired candlesticks on the corners of the altar in his text De Sacro altaris mysterio - apparently indicating that this was standard practice by the early 13th century. They are also illustrated standing on altars on many of the reliquary chasses produced at Limoges (eg panel from a chasse, V&A, 4041-1856). Similar shaped candlesticks, though of a larger scale, were used in processions, or held by acolytes (cf fig.450, E. Rupin, L'oeuvre de Limoges, Paris, 1890, chasse from church of Banise (Creuse), France) – the central knop on the shaft provided a useful grip. Limoges candlesticks appear in documentary records: the chronicles of Saint-Martial of Limoges describe a pair of enamelled candlesticks in 1208. They were also commonly exported (eg a 13th century inventory of St Paul’s cathedral, London, describes a pair of candlesticks ‘de opera lemovicensi’ [of Limoges workmanship]. There is often some uncertainty as to whether so-called Limoges enamels were produced actually at Limoges or nearby (sometimes even over the border in Spain). But the use of white dots on a blue background (as seen around the dragons on the base here) seems to be a particular Limousin hallmark.